By what standard do you call a man “good?” Think about the answer to that question before you continue reading. Freemasonry is incompatible with Christianity. Pastors who are familiar with the Craft are well aware of this. For this reason, a great many pastors avoid membership in the Lodge. They know what it is and they want no part of disqualifying themselves from their offices by besmirching their reputations by being associated with Freemasonry. But what about the Freemasons in their congregations? Should they be compelled to renounce Freemasonry or face church discipline? Some pastors say, “No.” One of the common defenses that I’ve heard from the pastors of Christian Freemasons is that the Freemasons in their particular congregations are “good” men who do a lot of “good” things. In a peculiar demonstration of cognitive dissonance, pastors take the position that it is okay for the Freemasons in their own congregations to participate in the Masonic Craft while simultaneously admitting that the Masonic Craft is incompatible with Christian faith and practice. By what standard are these judgments about Masonry and Masons made? Let’s start with thinking about what makes something good from a moral standpoint. Ultimately, morality is either subjective or objective. Subjective morality can be determined by organizations, societies, or perceived utility. This type of morality is relative. It is different from one man to the next. Objective morality is not. Objective morality is and can only be grounded in the nature of God. God’s nature is revealed in His word, the Holy Bible. So, only by a Biblical standard can we call something objectively morally good. It is by a Biblical standard that Pastors determine that Freemasonry is objectively immoral. Is this the same standard Pastors use to determine that their Masonic church members are good? It’s impossible to deny that Freemasons engage in service and good works. As a brotherhood, Masonic Lodges fund orphanages, raise money for charity, support children’s hospitals, and engage in community service. As individuals, Freemasons are often visible participants in church service. Freemasons often serve in their churches as ushers, event security, Sunday School teachers, and even Deacons. Freemasons do a lot of good things. But are they good men? No institution was ever raised on a better principle, or more solid foundation. Nor were ever more excellent rules and useful maxims laid down that are inculcated in the several Masonic lectures. The greatest and best of men, in all ages, have been encouragers and promoters of the art, and have never deemed it derogatory to their dignity to level themselves with the fraternity, extend their privileges, and patronize their assemblies. Mr. (name inserted) you are received into Masonry upon the point of a sharp instrument, piercing your naked (left) breast which is to teach you that this is an instrument of torture to your flesh, so should the recollection thereof be to your conscience should you ever reveal any of the secrets of Freemasonry unlawfully. Aside from the violent nature of this charge, it defies the Christian understanding of the good. If Masonry can make good men better then why wouldn’t Masons share their good philosophy with all who are willing to hear? To share good news is the commission given every Sunday at the end of church services. Church members are exhorted to go out and proclaim the good news to whosoever will receive it. Yet Masonry shrouds its philosophy from women, slaves, and those men who are unwilling to take its oaths. I, ________, of my own free will and accord in presence of Almighty God and this right worshipful Lodge erected to Him and dedicated to the Holy Saints John, do hereby and hereon, do solemnly sincerely promise and swear I will always hail, forever conceal and never reveal any of the secret arts, parts or points of the mysteries of Freemasonry which have been, may now or shall hereafter be communicated to me in Charge as such, to any person in the world, except it be to a true and lawful brother free Mason, or in a legally constituted lodge of ancient free and accepted Masons, and not unto him nor them therein until after due, trial, strict examination or lawful information, I shall have found them legally entitled to receive the same. I, furthermore, promise to swear that I will not write, indite, print, paint, stamp, stain, cut, carve, mark, or engrave the same upon anything moveable or immoveable under the canopy of heaven, whereby the least word, syllable, letter of character thereof may become legible to myself or intelligible to others, and the secrets of Freemasonry be unlawfully obtained, and that through my unworthiness. To all of which I solemnly and sincerely promise and swear to keep and perform the same, without any equivocation, mental reservation or secret evasion of mind in me whatever, binding myself under no less a penalty than having my throat cut ear to ear, my tongue torn out by its roots, and with my body buried in the rough sands of the sea, a cable’s length from shore, where the tide ebbs and flows twice in the twenty-four hours, should I ever knowingly or willingly violate this, my most solemn obligation as an entered apprentice, so help me God and keep me steadfast in the due performance of the same. The Westminster Confession of Faith states that “a lawful oath, being imposed by lawful authority, in such matters, ought to be taken” (XXII, 2)… From the viewpoint of Christian ethics (the Oath for Entered Apprentice to Freemasonry) oath is open to serious criticism on more than one score. The Christian, bound as he is to maintain justice and equity before God and man to the best of his powers, has no right to pledge himself in advance to keep secret something the bearing of which on questions of justice and morals he cannot know. And, aside from the question whether an oath is not too solemn a transaction for a ceremony of such doubtful importance as reception into a mere human organization, it must be said without hesitation that the violence of this oath is plainly contrary to our Lord’s principles of speech as set forth in Matthew 5:34-37. In changing from one degree to another, many Lodges omit too much. The old story is ever new; and the secrecy, beauty, and religion of Freemasonry are impressively suggested by these ceremonies which should not be unnecessarily curtailed. Simply put, one’s religion must be Christianity or something else. When a Christian is asked, “Which of these two is your religion?” his answer can never be “both.” That is syncretism. The Biblical record is clear. A jealous and Holy God does not stand for syncretism among His holy people. So why do Pastors allow for Masons to remain in their congregations? A man must sin in order to enter Freemasonry. He must, especially if he is an officer of the Lodge, continually commit sin to grow the lodge by administering sinful blood oaths and presiding over other religious ceremonies. The truth is, there is no such thing as a good Christian man who is a continual participant in Masonry. The good Christian mason is the fiction in the mind of a compromised pastor. What is the cause of this compromise? It could truly be genuine ignorance, honest theological ineptitude, or cognitive dissonance. It could also be another: Economics. No one knows the ins and outs of a congregation better than its pastor. He knows whom he can challenge and whom he cannot without being fired. The simple fact of the matter is that challenging Freemasonry will be the end of their paid employment at their churches. The more Freemasons the pastor has in his congregation, the greater threat he faces from them. Freemasons are sworn to come to the aid of another Mason in distress except in cases of murder or adultery. The brothers of the Lodge can be a powerful subgroup among the brothers and sisters of Christ. Can a pastor go up against masonic ushers and deacons and expect to keep his job? Can a pastor go against a grandfatherly worshipful master or Lodge Chaplain and expect no pushback from the congregation? Complicating the matter is that, due to the secrecy of Freemasonry, many church members are unaware of the unbiblical nature of Freemasonry. Church members do not know about the darkness of freemasonry but they do know about the goodness of a trusted usher or deacon. Church members should ask themselves how well they really know the Freemasons in their churches. Freemasons take progressively violent blood oaths to enter the higher and more secretive orders of Freemasonry. If a pastor overcomes the fear of man and puts his livelihood on the line to challenge Freemasonry, should church members not at least try to give him the benefit of the doubt? If the pastor is open to biblical teaching and the mason is secretive and withholds details about the Lodge, the party that should be trusted and supported is clear. Many pastors are under immense revenue-related pressure. The youngest generation is not as church-going as the oldest. As church members die (and cease tithing) churches struggle to fill the vacant pew with new, younger church members. Baptism numbers are down across the board and church leaders are left wondering if their churches will survive. Pastors are often expected to grow the church, but challenging Masonry could shrink already anemic attendance rolls. The pastor is morally obligated to trust God enough to follow the biblical prescriptions for addressing sin in the body. This may cause division. This may cause a church split. This may cause the exit of lucrative donors from the church (pastors are in the unenviable position of having their salaries funded by the very persons they must sometimes rebuke). This may cause church members to have to take an uncomfortable stand for Christ and against the sin of their close friends. This may cause the pastor to lose his job. Like the rest of the world’s men, pastors have wives and children to support. What is a pastor to do? There was a hill called Calvary. Upon it, Christ died to atone for the sins of his elect people. He died for the people the Father had set apart for his own possession. For Jesus Christ, salvation and holiness were hills worth dying on it. Christians must die to self, having picked up their own crosses to follow Christ. Freemasonry in the local church cannot be approached as a matter of pragmatism. That’s utilitarian ethics. That’s relativism. That’s moral relativism. Objective goodness is grounded in God. God demands better. He has provided the Holy Spirit for strength. A stand against Freemasonry is not a stand against Freemasonry but a stand against sin and a stand for holiness. It is a demonstration of faith. Church members are often beleaguered by the state of the world. In the United States, we watch abortions, homosexual offenses, and hatred of Christianity become more and more socially acceptable. We long for revival. We pray for revival. But we tend to see the problem outside of the church. What if it is on the inside? In the Bible, Israel experienced revival when King Josiah led God’s people in mournful repentance. Just maybe God will spark a revival in the church that faithfully repents and seeks God’s face and forgiveness. Akin, J. W. (1911). 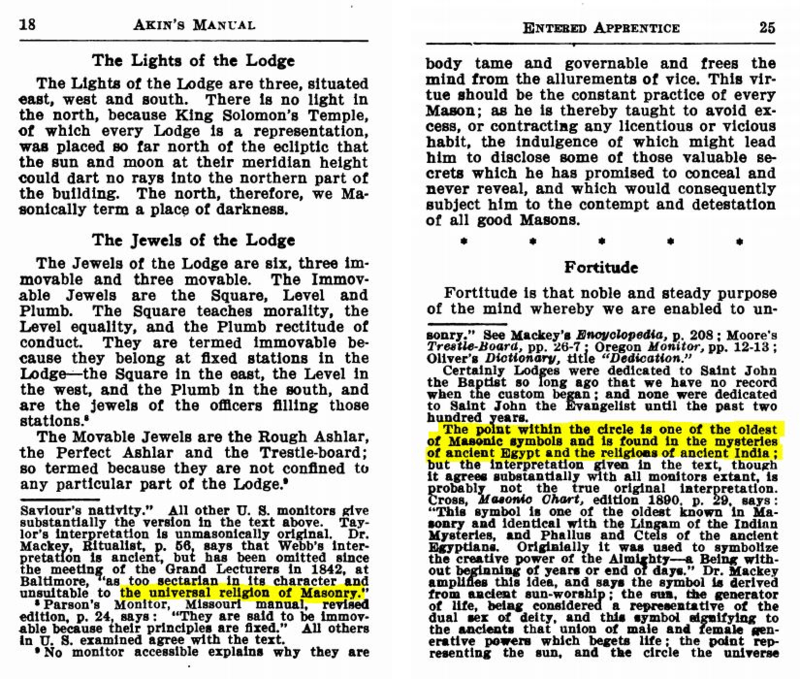 Akin’s Lodge Manual With the Georgia Masonic Code. Mrs. John Akin. Harris, J. (1983). Freemasonry: The Invisible Cult in Our Midset. Towson, Maryland: Jack Harris. Secret blood oaths are not the only part of Freemasonry that are incompatible with Christianity only the first. Strangely enough, Akin writes on page 125 of his manual that “Though Masonry be not religion, it is emphatically religion’s handmaid…” This statement contradicts other indications in the manual which state that Masonry is a religion. Previous story A Pastor and a Polemicist?